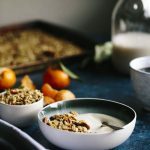 This coffee orange granola combines both flavors into one QUICK and healthy granola recipe. Combine oats, pecans, sugar, and salt in a large bowl and set aside. Combine coconut oil, coffee, syrup, and vanilla in a separate bowl; stir, and then add wet ingredients to the oats and stir until the oats are coated. Last, add the orange zest. Spread granola out onto a large baking pan and place it into the oven. Bake granola for 15-20 minutes, or until oats are slightly golden around the outside of the pan. Another way to test this is to remove the baking pan from the oven and place it on top of the stove for 2 minutes. After 2 minutes, if your oats have hardened, then it’s good, but if they’re still soft, you’ll need to bake the granola for a few more minutes. Remove from the pan, wait until granola has cooled, and enjoy!